Twelve months of table toppers with a ton of character!" 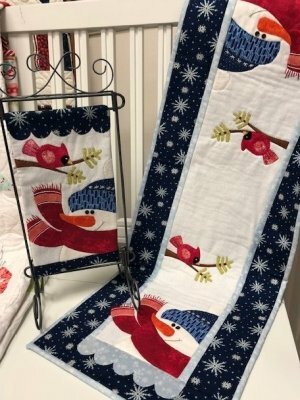 Each month for 12 months you will receive the pattern plus all fabric to complete the tops, bindings and backings for both the table runner (12" x 36") and the small (6" x 12") hanging. A table stand from Ackfeld is available for an extra fee. This program begins in January, 2019 and is non-refundable and may not be canceled. You may join at anytime. The cost is $ 30 per month, plus shipping.